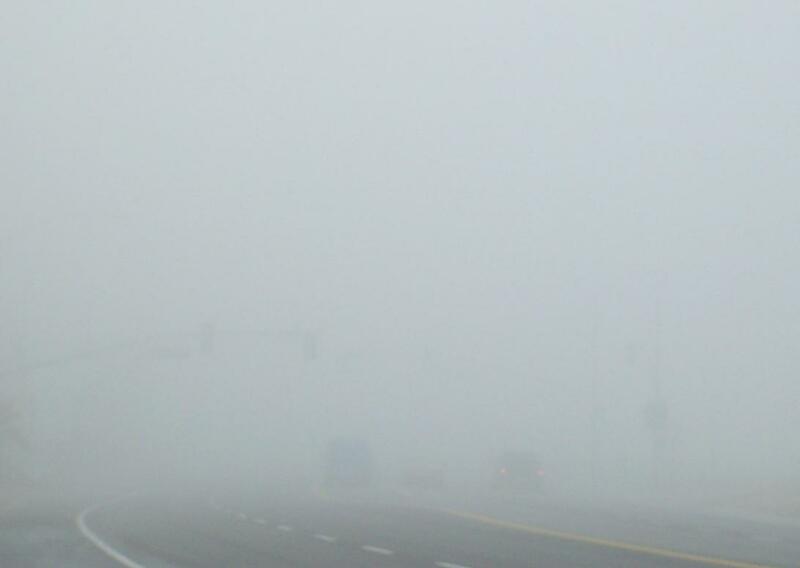 I drove in fog like this once– it’s called tule fog and it can enshroud the I-5 freeway running all the way up central California. Anderson’s Pea Soup has nothing on this stuff!! At the time I was 22 or 23, making the trek north from Los Angeles to visit my Honey in the Bay Area. Well I found a big truck and rode in its wake, just barely making out the taillights. I figured if there was something terrible up ahead, the driver would either see it and stop in time, or somehow protect me by absorbing the resulting crash. Talk about white knuckling it– It was the first & only time I made that trip without a potty break ;-). Growing up in the San Francisco Bay Area and now living in the Pacific Northwest, I am very familiar with fog– the coolness, the quiet, the lingering layer in the morning and the blanket that rolls in at night. Lately I’ve become more intimately aware of its properties while walking a couple of mornings a week with my friend in the o-dark hours. Ever notice how much more difficult it is to breathe in fog? Akin to the weight of humidity during a mid-west summer, there is something distinctly different about maintaining air support during a brisk walk in the fog. My joints can feel it too!! Granted, I have a bum knee, (feel free to read my “Walking Miracle” posts for more on this subject) but even so… It’s not that you get especially chilled while walking in the fog; there’s just an overall damp feeling that’s hard to shake. Then there are the many movies that use images of fog to frighten the audience. What is the mystery of this simple vapor? (Once my husband-to-be and I went to a drive-in movie of a film called simply, “The Fog”. To be honest I really couldn’t tell you how scary that one was– the car windows fogged up on the inside–but that’s another story :-)) Still, why does the very mention of fog invoke everything from a sense of foreboding to out and out fear? I think it speaks to our greatest weakness as human beings: We want to see what’s coming… We want to be in control. One of the biggest struggles in any faith walk is having complete trust in the unknown. Though our head knowledge may be pointing to the goodness of God, our heart might have trouble believing our suffering will end! So out of our own human weakness, when faced with the unknown, we worry or we strive, we pity or we deny, we withdraw or we rebel, but to sit in fog and trust? … that’s tough. Facing another transitional period in my life, and witnessing close friends currently struggling with grief and confusion, it’s no surprise to me that I’ve been pondering all of this recently. Now I don’t have any pat answers, and I’m not completely sure where I’m going with all of this yet. But then again, isn’t that just like fog? What DO we do when everything falls apart? Tears… blaming and anger…. fear…turning to alcohol or shopping or some form of legalism to self-medicate… How about struggling to understand? If we’re honest, we’re all guilty of this from time to time, yet this desperate search for explanations only leads to more unrest and a weakened faith! Trying to understand difficult circumstances is really about fighting to have control over them. It is about trusting in ourselves more than trusting in God! There’s a time and a season for everything, and for me, this summer has been one of significant loss and change–emotionally, physically, and spiritually. A dear friend & mentor succumbed to cancer; another close friend struggled as her marriage unraveled. Transitions are happening all around me as my sons are entering a new season of life; my ministry is simultaneously undergoing both growing pains and a shrinking performance schedule as we’re forging new territory, and I’m dealing with a chronic health issue that has come with getting older. I can sense that I am being trained, but having no idea what the preparation is for (and hearing nothing on that subject yet), I’ve been doing a lot of thinking about the nature of faith. I’m reminded of the old expression, “when the rubber hits the road” (presumably, how do we handle ourselves when things “get rocky” or “slicked with ice”?). I asked my husband, my favorite rocket scientist, what was meant by the expression. I figured he would explain to this non-scientific brain about the physics or friction or some such thing as it applies to tires and asphalt. Instead he said, “that’s where the action happens”. What an interesting point! 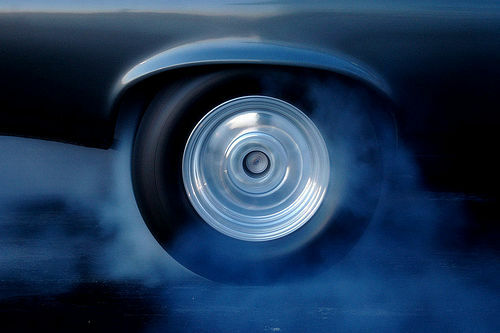 The engine gives the car it’s power, but the tires let it do its job. So, how we travel through this journey of life is all about our faith. God’s Word tells us that faith is trusting in things unseen (there’s that TRUST again), and to trust in the Lord with all our heart; leaning not on our own understanding. Faith is also described as a shield, fending off the fiery darts of lies, bitterness, betrayal, and sorrow, thrown at us from dark places. Don’t YOU want the most active faith muscle– biggest shield, best traction tires– you could have, when everything crashes and burns around you?? And please hear this, whether or not you believe in God, we all have faith in something– wealth, education, politics, family… Sadly it’s when disaster strikes that many of us realize that even the most noble of human beings make mistakes, and man-made systems fail. Growing up in a secular family in America, I was raised on the belief that I could “pull myself up by my boost-straps”. I was my own little demi-god for far too many years. It’s sobering to think about the messes I’ve created. Frankly, in this world filled with loss, corruption, and suffering, I’m grateful to know the Creator of the Universe is in charge, and that He is GOOD. Only God can transform our messes into beauty.